Gah…so January’s been eventful already! I’ve been so good with eating healthily as per the rituals of The January Detox (I’m currently eating a bowl of steamed purple sprouting broccoli…no jokes) that I started to reminisce about this mega easy flan I made for a huge Christmas feast last December. Now there’s a reason that this recipe is called version 1, because this produces quite a firm flan with more of a bite than a creme caramel’s soft unctuousness, but it’s yummy, velvety and uses whole eggs. Which is handy if you don’t really have the time to separate your yolks and have left over egg bits. PLUS it’s probably the only non-cooking recipe I’ll post here because it uses tins of evaporated milk and condensed milk. 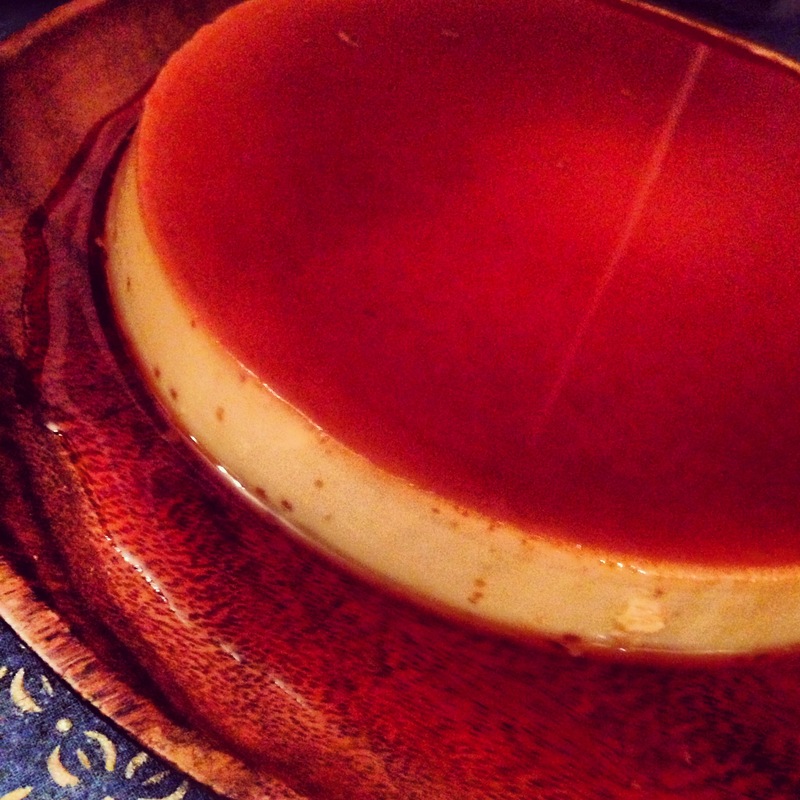 But once I crack the perfect soft flan that doesn’t liquify on turning out, version 2 will be out with a gusto. I can promise you that. Get your oven to 170°C. Put the sugar, and tablespoon of water in a heavy bottomed pan on stove on medium heat. Without shaking the pan, wait for the sugar to caramelise. Careful not to let it burn, you can use a metal spoon to stir it all together towards the end, but in general with making caramel just leave and watch it. While it’s getting on its way to all lovely and golden, take the dish you’ll cooking your flan in (I used a 10 inch pyrex dish) and place it in the oven for a bit just to warm it up. This just stops the caramel from seizing up in a cold dish. So once the caramel’s done (try not to place the spoon covered in liquid hotter than the sun in your mouth) carefully pour it in your dish and swirl it all around set it aside and let it cool. In a large bowl, pour in all the condensed milk and carefully stir in the eggs. ‘Stir’ being the operative word, you don’t want to vigorously whip it all up and create air bubbles. Once throughly mixed add the evaporated milk, whole milk and vanilla essence and combine it all together. Decant your creamy mixture through a sieve into your caramel dish. Cover with foil. Now place this into a water bath in the oven. So that’s a larger deeper oven tray filled with water until it reaches halfway up the flan dish. Bake for 60 mins. Or until the centre is no longer liquid when you wobble it a bit. Leave it to cool thoroughly and when you’re ready to serve, run a sharp knife round it, place a plate on top and flip that flan over. Feeds 6-8.